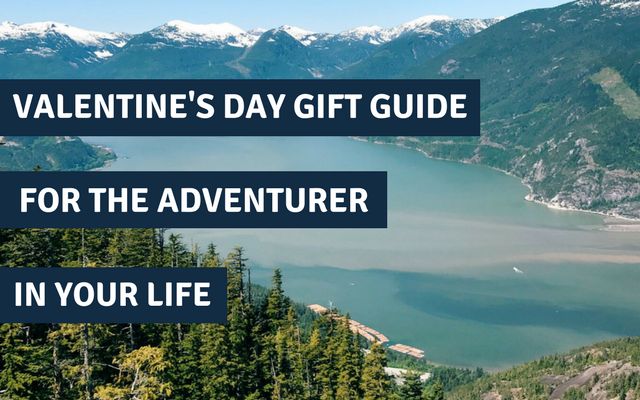 A Valentine's Day Gift Guide for the Adventurer in your life! 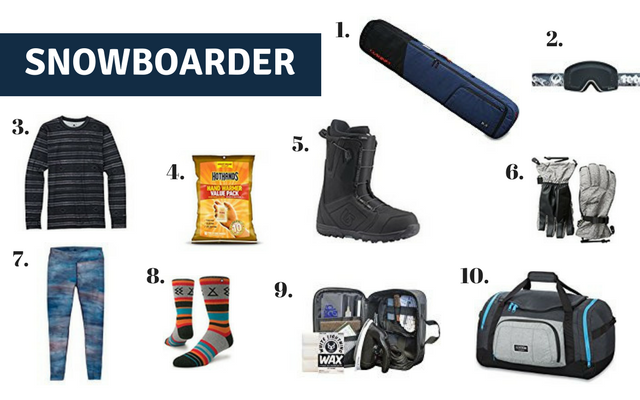 Gift guides for campers, camp chef, hikers, snowboarders, overlander, action photographer, dog lovers and more. 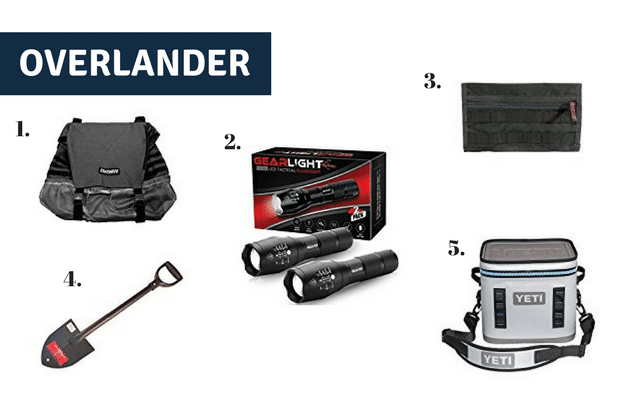 With Valentine’s Day right around the corner, we put together this handy gift guide for the adventurer in your life. A wearable sleeping bag that will keep you or your significant other cozy no matter where you are: camping, at a tailgate or even on the couch. With zippered shoulders, you can still have full use of your arms and you can use the napsack in three ways: sleep, lounge or walk mode. Let there be light! A good lantern always comes in handy at a camp site. Keep them (or yourself!) warm and looking good. A hammock is a great way to sit back, relax and enjoy the sights. This doublenest hammock from ENO lets you lounge solo or your significant other. You’ve gotta have a place to pack your gear and the Base Camp duffel is a good looking pack with plenty of room, including an extra compartment for wet gear if needed. 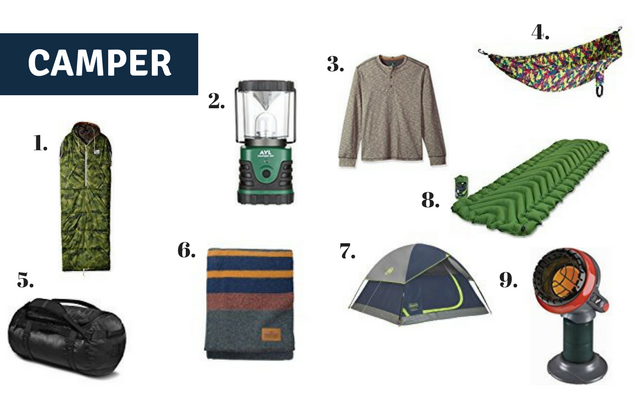 If you’re going to be camping, a tent is a must and they come in all different shapes and sizes depending on if it’s just you and your significant other or if you’re bringing friends along as well. Keep you (and a loved one) off the ground and without rocks in your back with a comfortable sleeping pad. Bonus: these pack down small in an included stuff sack for easy travel. Stay warm and cozy in your tent with a heater like the Mr. Heater Little Buddy. You can read our full review it on it here. A good cooler is a major part of the camp experience. Keep your food and drinks cold and you’re in business. The Yeti Tundra 45 cooler is bear resistant, comes with a dry foods basket and will keep your food cold and ready to go. A collapsible camp sink takes up minimal space, collapses for easy storage and is great for cleaning dishes (or other things). A good set of camp pots is important and the best part of the Sea to Summit X set is how compact and functional they are. They collapse down then nest inside of each other for easy storage. A workhorse at a campsite. 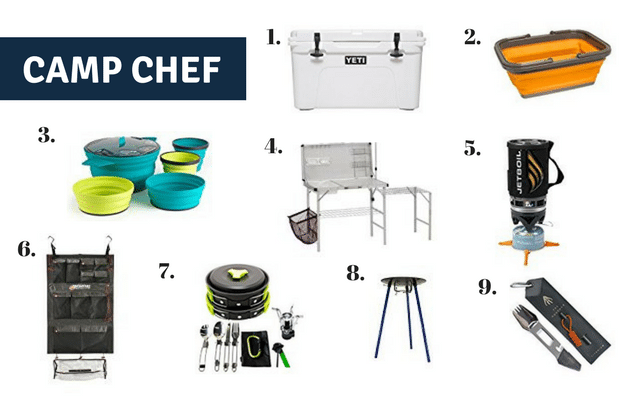 Don’t take up all the room on the camp table with your grill and cooking supplies. Having a dedicated space to prep ingredients, make meals and store equipment is a huge time saver. A quick and easy personal cooking system is great for those times you don’t want to spend a lot of time cooking. The Jetboil is a compact cooking vessel that takes up minimal space and can bring two cups of water to a boil in two minutes. An organizer’s dream come true, the Tailgaterz Hang n’ Haul makes it really easy to keep all of your kitchen and cooking gear organized in one spot, whether you’re camping or tailgating. Save space and be prepared for all your outdoor cooking adventures with a mess kit. This 17 piece camp mess kit comes with everything you need for meal time including cookware, dinnerware and even a mini stove. Takes up minimal space and packs down for easy storage. The Skottle from TemboTusk is like a Wok on legs, perfect for cooking up camp meals for a large group or for your family. It can cook a variety of dishes and the legs are removable so it can pack down for easy storage. The Muncher multi-tool utensil features ten different functions including spork, knife, can opener, peeler, bottle opener, fire flint, cord cutter, screwdriver, pry-bar and a box cutter. Strap it to your backpack and it’s all you’ll need for eating. The Trasharoo is a heavy-duty off-road trail trash bag made to be installed over your spare tire great for picking up trail trash, carrying firewood and keeping the interior of your truck clean. Read our full review here. Compact, ultra-bright and long-lasting, these LED Flashlights can focus on objects up to 100 feet away. This Tactical visor panel organizer keeps your gear close. Fully adjustable size and MOLLE attachment system lets you attach MOLLE compatible accessories. This shovel features a compact design, all steel construction and 14 gauge steel head. Designed for superior comfort and durability. Keep your food and drinks cold for days at a time. The Yeti Hopper flip is waterproof and resistant to mildew, punctures and abrasions so it can hold up to whatever adventure you throw at it. There’s nothing more important than making sure your pup has enough food and water and it’s super handy to have a collapsible food and water bowl set for when you’re out. Keep dog food fresh while you’re on your adventures. The kibble carrier is a convenient way to carry dog food and treats with the ability to roll the bag down to keep the food fresh. For hikes or other adventures, water is always super important. The H204K9 water bottle is convenient because it’s a water bottle and bowl in one and you can dump the water back in the bottle from the bowl if your pup doesn’t drink it all at once. Keep your dog comfortable, this sleeping pad will keep your pup comfortable. It’s always good to be prepared so having a pet first aid kit is a good idea. This one is convenient because it can clip to your pack or bag. Your dog is bound to get dirty on your adventures so if you’re out and about and can’t give him a bath, these wipes are great to have for a quick freshen up. If you’re into hiking or backpacking with your pup, a backpack harness can be useful. They can even help carry some of their stuff like water bottles. 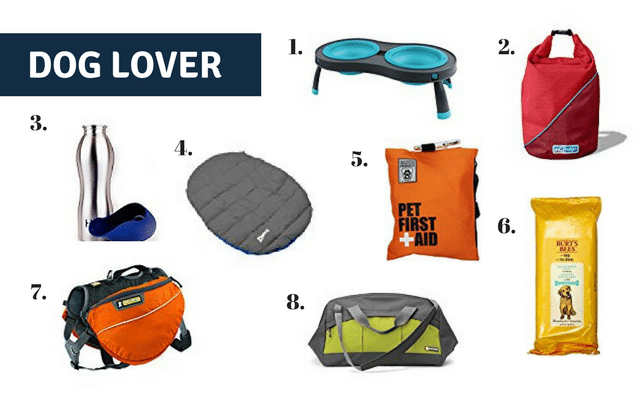 If you take your dog on a lot of adventures, it’s nice to have a gear bag you can grab and go with all your dog’s essentials. The Ruffwear haul bag is a great option with it’s multiple pockets and high-quality construction. Some of the most comfortable towels money can buy. These Turkish towels only get softer after you wash them and they can be used to lay out, get dry after going in the water or as a wrap. It’s always fun to get a game going on a beach day. Spike Ball is an easy to pack and fun game similar to volleyball but on a trampoline. Great for multiple people to play and even better if you have a tournament! Show the one you love how much you love their skin by helping them protect it. This is great to have if you want to take a little break from the sun for awhile to read a book or just hang out. It’s also nice because it offers some privacy. Keep the sun off their face and let them look good doing it. 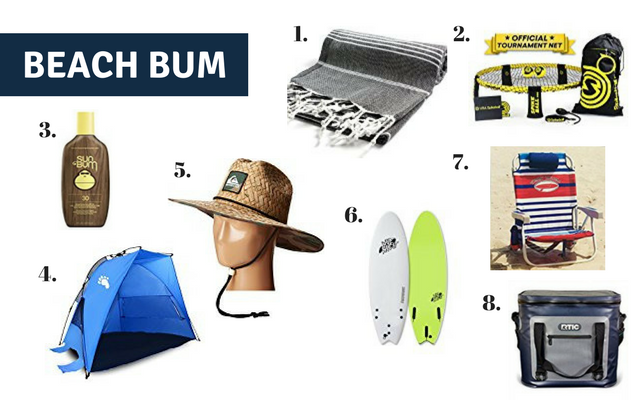 If you really wanna go all out for the beach lover in your life, get a surfboard! Surf lessons would also be a great day and a surf session or surf lesson date would be primo. There’s nothing better than kicking back and relaxing in a comfortable chair watching the waves crash with someone you love. These chairs are great because they also have a handy cooler on the back for you to store snacks or drinks. How can you have a successful day at the beach without a cooler full of snacks and drinks? This will easily keep your drinks and snacks cold for even the hottest beach days. Having memories of your adventures is always fun and a GoPro makes it easy to capture the moment without getting in the way. An easy way to capture a road trip or flight with a suction cup mount. 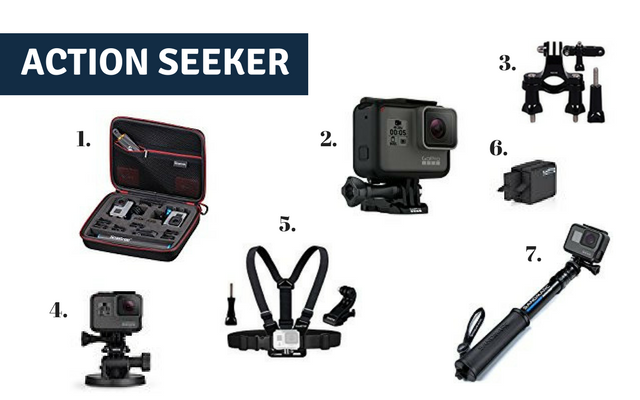 A chesty harness makes it easy to capture all kinds of adventures like mountain biking, kayaking, dirt biking, riding an ATV, etc. Nothing is a bigger bummer than your cam dying right in the middle of capturing an adventure so having an extra set of batteries is clutch. A telescoping pole, or a “selfie stick”, makes it easy to capture a moment even when you don’t have someone else to take the shot. This Dakine bag can hold two snowboards, one with bindings attached (yours and your significant others!) so it’s perfect for travel. It also includes a removable boot bag. Get the snowboarder in your life a fresh set of goggles. Keep them warm with a nice base layer long sleeve. Nothing is worse than your hands being cold so grab some hand warmers to keep them warm and toasty. Of course every boarder needs a good pair of boots. Even if they already have a pair, consider getting them new ones like this which feature the Speed Zone lacing system. Keep your hands warm and toasty with a good set of gloves. These are great because they’re touch screen compatible and they feature an interior liner that can be worn on it’s own for those warmer days or for when you want a less bulky glove option. Similar to the thermal long sleeve, a good set of base layer thermal pants comes in clutch when you’re getting ready to head out on the mountain. Plus with so many different color and pattern options, you can definitely find something in their style. Is there anything better in cold weather than a nice pair of wool socks? Let them keep their board in pristine condition with this complete tuning kit. This is a great multi-purpose and functional gear bag for the snowboarder )or mountain biker) in your life. Read our full review of the Dakine Descent Duffel here. 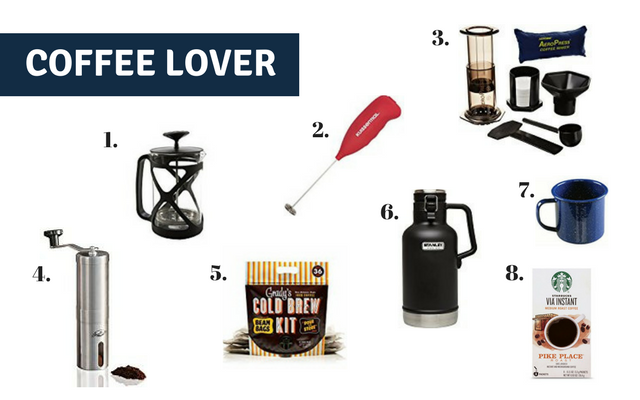 An easy way to make coffee in the great outdoors. All you need is coffee grounds and hot water. For those that like Bulletproof Coffee or lattes, you can use a battery operated frother to mix it up how you like it. Another great way to make a fresh cup of coffee in the morning. Freshly ground beans taste best so the coffee lover in your life will definitely appreciate the ability to grind fresh beans while camping. If you or your significant other prefer cold brew coffee to hot java, you can put one or two of these pouches in a jar with some water and you’ve got fresh cold brew in the morning. Keep your cold brew coffee (or beer) cold and ready to enjoy! You gotta have a cup for your morning cup of coffee and these enamel coffee mugs are a good option because they can withstand some abuse at the camp site. Equally good with coffee and a cocktail at the end of the night. If you don’t have a ton of space or like to carry a lot of gear, these instant coffee packets come in handy. All you need is hot water and you’re ready to go. Be ready for whatever comes your way with a credit card survival multi-tool. A five-in-one multi-tool all in a bracelet: a compass, whistle, knife, flint fire starter plus a fire scrapper. We all need something to eat with. Clip this to your backpack and you’re ready to go. Gotta wash dishes, gotta have soap. Having a small container of camp soap is nice to throw in your cleaning basket. Bonus: you can re-use the container and add more soap once you’ve used it all. Quick prep, easy to make and you’re on the go. For vegetarian freeze dried meals, check out our post on Vegetarian Dehydrated Meals for Camping or Backpacking. Let there be light. 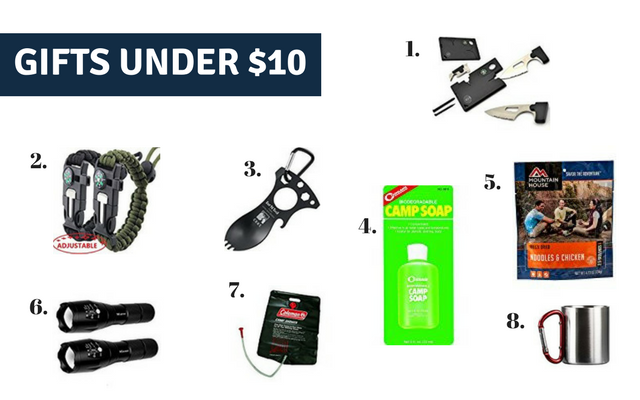 Flashlights always come in clutch at a camp site so make sure you’ve got a few stashed away for when you need it. Sometimes there’s nothing nicer than a shower. For those times when the camp bathrooms aren’t up to snuff or you’re deep in the wilderness, grab a solar shower. Coffee cup, cocktail cup, water cup, you name it. Clip it to your pack and you’re ready for your beverage of choice. For a fun Valentine’s twist, fill it with chocolates before you give it to your Valentine!